Once upon a time, cabinets were built on site by trim carpenters. Today, that’s true only for the highest-end units. Most are now made in shops or factories, where the environment is ideal for controlling wood quality and craftsmanship. There are three levels of quality and customization in cabinets: stock, semi-custom and custom. Stock cabinets cost the least and offer the fewest options. You buy factory-assembled, standard-size units at a home center, and you install them or hire a contractor to do the work. Semi-custom cabinets are made by higher-end manufacturers or local, independent cabinetmakers and are often sold in showrooms. Semi-custom cabinets offer a number of mix-and-match options and dimensions but, unlike with custom cabinets, you don’t get to decide every detail. Even if you go for the custom work, you’ll deal with the cabinetmaker only when he measures the space and installs the finished product. And for semi-custom units, you may never meet the craftsman who creates them. How, then, can you make sure the extra money you lay out for quality cabinets is well spent? Start by working with a showroom or local shop that has a long-term relationship with your contractor. Nothing affects the look of a new kitchen or bath more than the cabinets. That gives the contractor a strong incentive to choose a dependable manufacturer or craftsman. And unlike drywalling or plumbing, where mistakes are glaring, it takes a trained eye to tell good cabinets from bad. Because more homeowners choose semi-custom units, we’ll focus on them, while also touching on custom cabinetry. With semi-custom cabinets, you work with a sales representative to choose from among common wood species like maple, oak and birch, along with paints, stains and door and hinge types. 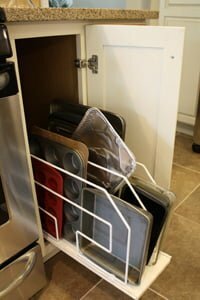 You also have some control over where to locate add-on options, such as oversize drawers and rollout garbage caddies. You’ll also choose wall cabinet heights and cabinet widths in 3″ increments. You order a run of cabinets the combined width of which will fit in the opening and any filler panels required to cover gaps. Go with custom units, and you get precise widths and heights, as well as custom positioning of a full range of add-ons, like a lazy Susan or an appliance garage. You can create odd angles, or specify nonstandard countertop heights. You can even make cabinets match existing antiques or appliances with special molding profiles, wood species, and stains. You’ll work closely with a cabinetmaker who comes to your home to get a feel for the space, discuss your design theme and take measurements. Then he’ll return to install the one-of-a-kind units he built just for you. What’s the price of going custom with a local cabinet shop? In my area of the South, there’s about a 20% price jump between levels. If, for example, the bill for semi-custom cabinets is $6,000, figure on at least $7,200 for custom units. Prices usually include a standard laminate countertop. Specialty countertops, such as granite or solid surfacing, cost extra, with your cabinetmaker commissioning the work. When purchasing semi-custom units, you’ll choose the general cabinet type and preferred features at an initial meeting with your contractor. Bring show-and-tell photographs, clippings from magazines or design books to provide a general idea of what you want. This is where you’ll talk wood species, finishes, door type (raised or flat panel), and countertop choice (laminate, solid surfacing or stone). You and your contractor will typically be working based on an allowance—a not-to-exceed figure you’ve agreed on to cover purchasing and installing the cabinets. If the allowance is $7,000 but you’re showing your contractor photos of oversize solid-cherry units with beveled-glass doors and solid-surface countertops, he may present you with choices that are more realistic for your budget. Or you can pay the difference. Once you’ve matched your wishes with your budget, it’s time to visit the showroom. The contractor should call ahead to tell the sales representative the final cabinet allowance, cabinet type and general features you’ve settled on. The rep should also have the most current copy of the building plans. Working from your preferences and plans, the sales rep will assemble a clear picture of how the cabinets will be customized. He or she should walk you through everything: drawer rollers and pulls, counter height and depth, shelf arrangement, hinges, joinery styles, molding profiles and add-on accessories. Remember, small decisions can really run up the bill. Features like undershelf lighting and a rollout cutting board cost only $40 each, but including a number of such items can quickly add several hundred dollars to the cost of the cabinets. A good sales rep should tell you all the prices and provide you with subtotals during the selection process. By the end of this meeting, the rep should have enough information to present a firm price that includes all your choices. If you’ve chosen accessories that put you over your allowance, your contractor will give you an “overage bill” for the difference between the allowance and the added cost, plus any extra labor involved. Custom cabinets work much the same way as semi-custom units. The difference is that the showroom may be the cabinetmaker’s shop, and the sales rep is often the cabinetmaker himself. Whichever route you choose, finalize key decisions now. Although you can easily swap out drawer pulls later, changing countertop height and width, door type and other essentials on the fly is disruptive and expensive. Next, the cabinetmaker either visits your site to make measurements or works from plans. Allow at least three to four weeks of lead time for semi-custom cabinets, longer for custom units. That makes it crucial for you, your contractor and the cabinetmaker or sales rep to start the measurement process as soon as the job gets under way. When the cabinets finally arrive on site, your contractor should carefully inspect them for damage and sign off on their condition. If there are any dings, blemishes or misaligned elements, now is the time to discover them. Once the cabinetmaker has gone, all damages are the contractor’s responsibility – a sticky situation when it isn’t clear exactly who is to blame for a gashed door or nicked countertop. He’s more likely to spot poor-quality workmanship, inferior materials or cheap hardware. He can also rule out cabinets on which staples were used instead of high-quality joinery. Proper installation requires precise timing. Cabinets that arrive too early are susceptible to damage, while a late arrival can cause delays, because installation is squeezed in between drywalling and painting. Either of these scheduling errors can cost you significantly. Contractors tend to stick with a cabinetmaker who hits his deadlines. Kitchen components, such as the floor, trim and appliances, may be integral with the cabinets – and involve the electrician, plumber and floor installers, pros only your contractor can coordinate effectively. I’ve been doing construction for the past 20 years, and recently I was contacted by a home owner who purchased a house two years ago, that has turned out to be a living nightmare. He has sagging floors on the secound story that have dropped some 2.5 inches. The problem is that putting floor jacks under the second story floor is also causing the main floor to buckle under the weight. Now he is needing to beef up the supports to the main floor in the crawl space under the house. My question is: would it be better to take out the second story floor to re-set the second story floor joists, or would it be better to jack up the second floor after the main floor is beefed up or would there be too much weight pressing down from the roof and upstairs walls? Please advise thank you.